We have gained expertise in offering a genuine quality range of Cutting Tools to the customers at industry leading prices. The Cutting Tools offered by us are widely appreciated for their durable standards, corrosion resistance and dimensional accuracy. These tools can also be customized as per the exact details provided by the esteemed patrons. In our product range, we offer Gear Hobs, Gear Shaper Cutters and Broaches and Spline Broaches in different specifications. We are one of the most trusted names of the industry engaged in offering superior quality range of Gear Cutting Tools to the customers. 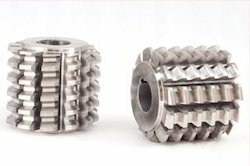 These Gear Cutting Tools are manufactured using high-grade raw material procured from some of the trusted vendors of the industry. In order to meet the market demand, we make available these Gear Cutting Tools to the clients in various sizes and other specifications.